As the door opened, I spotted Tyler as he scampered into the family room and closed the glass door, peering from behind it with an impish grin. As quickly as he went in, he came out and greeted me with, “Come downstairs.” The freshly bathed blonde boy grabbed my hand and steered me toward the staircase. “Now please.” I followed him down the basement steps and was taken to the family’s new dehumidifier where I was shown the buttons and lights of the new toy. In spite of the intense heat of one of the hottest days of summer in Southern Ontario, Canada, Tyler was dressed in long flannel button up pyjamas – a comical site as the rest of the family was dressed in summer wear. His insistence on wearing such inappropriate clothing is just one of many characteristics that give it away that Tyler is severely autistic. As Tyler explained the new device to me, (“Fan! Lights! On!…) I marveled at how far he has come in the two and a half years I have known him. 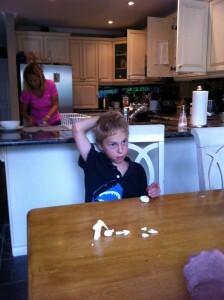 Although he doesn’t understand it, Tyler is a living landmark in the field of autism learning tools. Two and a half years ago, when he was just six and a half years old, he made history as the first person in the world to use a learning support unit called the NOIT™. NOIT Research is a private, leading edge Autism organization. Our purpose is the development of strategies that will support even the most severely Autistic individuals to learn to participate fully in life. A small percentage of the Autistic population, possibly 10 to 15%, are so severely handicapped with Autism that the development of language skills does not occur. The failure to develop language is a good indication of just how severely they are affected. Along with the failure to develop language, many of these individuals are also severely limited in the areas of self-care, social and emotional function, and focus and attention. Almost all exhibit ritualistic or repetitive behaviors (often called stims) or engage in self injury. This limited population of autistic individuals is the focus of NOIT Research. Ronald D. Davis was labeled a “Kanner’s Baby” as an infant. His desire to help others like himself led him to spend the past 30 years exploring unique and medication free strategies to assist those affected by Autism. After successfully creating the Davis Autism Approach® Program, it was recognized that a portion of the students it was created for were unable to use the tools and strategies that are the foundation of that program. Therefore, a unit called the NOIT was created to fill that void. The word NOIT is an acronym for Natural Orientation Inducing Tool. Its purpose is to support the Autistic individual in learning the tools necessary to proceed. NOIT is an acronym for Natural Orientation Inducing Tool. Natural Orientation, as used here, means establishing the proper viewpoint for accurate perception. Our concept of orientation is the person existing in a state of awareness of self in relation to the true facts and conditions of the environment. Inducing tool – means a tool to help the individual to learn to bring about a change in how they perceive their environment. For whatever reason, individuals with non-verbal autism didn’t create their own natural orientation. Because it didn’t fully occur, the individual is left unable to control their perception of the environment.The result is that the individual lives in a constant state of sensory overload or devises strategies to manage this overload themselves. This gives rise to many of the common characteristics we see in non-verbal autistic individuals. By learning to achieve an oriented state, they are able to perceive their environment much like the rest of us. This naturally leads to a lessening of behaviors characteristic of autism and allows the individual to spend more time learning how to interact appropriately. The function of the NOIT is to support an individual while they learn to establish a stable orientation. It cannot cause this directly, but by putting a auditory stimulus in the exact same place at frequent intervals (every eight seconds) for long periods of time, the person learns to keep their attention in one place. By keeping their attention in one place, they are able to accurately perceive the world around them from this place. When they can do this, we say that the person is “oriented”. Once the person can create and maintain an oriented condition, very quickly all of their perceptions will be functioning in harmony. This in turn removes the chaos from the environment and allows the person to function from a single perspective. Just over 2 years ago, Tyler became the first NOIT user. His success allowed others to follow. To date, 16 non-verbal autistic individuals have used the NOIT. They ranged in age from 6 to 41. They wore the NOIT between 6 and 12 hours per day for 4 to 6 months. All of their caregivers reported significant changes which indicated that these individuals learned to perceive their environments more accurately and were more able to take in the information around them. These changes included significant gains in focus and attention, sense of self, gross motor skills, social interaction skills, and language. Language improvement included better pronunciation and appropriate use of existing language as well as emergence of new language. One very successful individual was able to learn to speak recognizable individual words within three days, names of family members within a week, and three word phrases within three weeks. Importantly, all caregivers reported less sensory sensitivity, obsessive and ritualistic behaviors (stims), and self-injury. When we first met Tyler, he said less than 10 words – most of which couldn’t be understood by others. He asked for his favourite food, apples, with a sound that began with the short a sound and ended with a sound that resembled white noise. Although he seemed to understand much of the things said to him, he appeared to spend the majority of his time disoriented in his own world. Like most Autistic individuals, Tyler spent much of this time engaging in ritualistic repetitive behaviors referred to as stimming or stims. Tyler’s stims included throwing toy horses against the wall, manipulating the blades of helicopters, and lining things up. 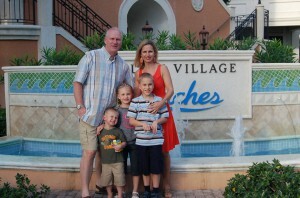 He was rarely interested in his surroundings or two younger siblings, Ashley and Mitchell. He had been in numerous therapies, was taking nutritional supplements, and was taking part in speech therapy, but the benefits were small. Tyler’s family was ready to take the leap of faith and allow Tyler to use the NOIT. 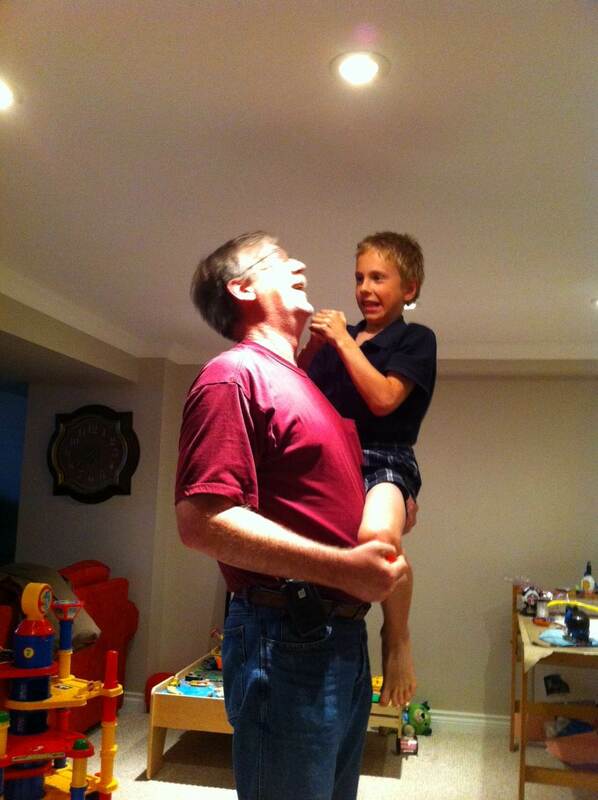 Once Tyler’s parents gave the go ahead, Ray experimented with ways to get Tyler to accept the NOIT being stuck to his back. Davis Autism Approach Facilitators do not force people to do things, but bring with them a patience and intention to offer the individual the opportunity to engage. Ray recalls: “I presented the NOIT and turned it on. The “ting” was audible. I played with Tyler with the NOIT and let him be the leader. When he went to another location, I followed him. When he played with something or engaged in some behavior, I found a way for myself and the NOIT to be a part of it. I believe following Tyler’s lead was the key to getting him to want to use the NOIT. He loves balloons, so we stuck the NOIT to one and let it fall from a staircase. He also loves toy helicopters so we had the NOIT ride in one. The first day, we didn’t get any further than that. “The second day, I demonstrated how the NOIT sticks to things by sticking it to myself – my arm, leg, hand, forehead – and then stuck it to Tyler’s sister the same ways. When all of the people in the house had tried it on, Tyler was still reluctant. We went back to playing. At the end of the session, Tyler appeared to be willing to try it on. His Mom pulled up his shirt and stuck it to him. He turned himself into a human pretzel, reached behind his own back and had the NOIT flung across the room in less than a second! We ended the session playing with a balloon with the NOIT stuck to me so it would end on a positive note and his Mom and I decided to try again the next day. Not all students take as long to decide to try the NOIT. Another of our students was anxious enough to try it, he put it on himself! Most noticeably, he began to learn to engage with this speech therapy and Tyyler’s language began to improve. His few words became more understandable; he learned new words and began to use them in 2 word phrases. As with typical language development, he began with nouns, then began to add adjectives and verbs, then adverbs, and finally little words like “the” and “it”. He also learned to say “Mommy”, “Daddy” and his siblings’ names. He became very proficient at using “Mommy” correctly! I visited the family one day to check in on Tyler’s progress. Tara and I were in the family room and Tyler wanted Tara to go see something and interrupted our talk with demands of, “Mommy, come!”. She explained to him that we were talking and that she would come in a minute and sent him on his way. However, Tyler continued to interrupt with increasingly louder demands of, “Mommy! Come! Mommy! Come!” until finally Tara exclaimed, “Tyler, will you be quiet!” Realizing the humor in the situation, we looked at each other and broke out in laughter at the irony. “Be careful what you wish for!”, we both said. Tyler’s language skills have continued to improve and he now speaks in short 4 to 5 word phrases. As with the other NOIT students that have followed in Tyler’s path, Tyler’s use of the NOIT allowed him to learn to begin to develop a sense of self. Toward the end of his time using the NOIT, he began to use words that reflected this new found sense of being an individual like “Me” and “Mine”. It’s been almost 2 years since Tyler finished with the NOIT. His progress has been steady. He maintained all of the gains he made while using the NOIT and has continued to develop in all areas. He also began the Davis Autism Approach Program with Ray Davis successfully in December of 2012. The Davis Autism Approach Program is made up of 3 parts. First is “Individuation”, which Tyler began with the NOIT and completed when he was able to make a clay model of himself and understand that it represented him. The second is “Identity Development”. Now that Tyler has an awareness of self and accurate perception, he can develop a greater understanding of the world around him. Tyler has begun this process by using clay to create the first several of thirty basic life concepts. He especially enjoys exploring each concept in the real world. He and Ray spend hours finding each concept in popping balloons, playing with toy helicopters and other everyday activities. This builds on and strengthens Tyler’s existing identity and understanding of how he fits into the real world. One particularly hilarious exploration of the concepts of “cause” and “effect” included Tyler filling the kitchen sink with bubbles and putting them all over his head, in his ears and even his mouth. The entire time, he tried to talk Ray into doing it too! The final phase of the program is “Social Integration”. When Tyler has completed his “Identity Development” concepts and explorations, he will be ready to build on that foundation to understand the key concepts involved in establishing relationships with others. The NOIT is now available through licensed Davis Autism Approach® Facilitators. The NOIT allows the student to complete the first stage of a three stage Davis Autism Approach® Program. Often, the family chooses to continue working with the facilitator to complete the remainder of the program. The full program allows the individual to learn the skills necessary to participate fully in life. If you know of someone who could benefit from the NOIT, please contact a licensed Davis Autism Approach facilitator www.davisautism.com or contact NOIT directly at [email protected]. 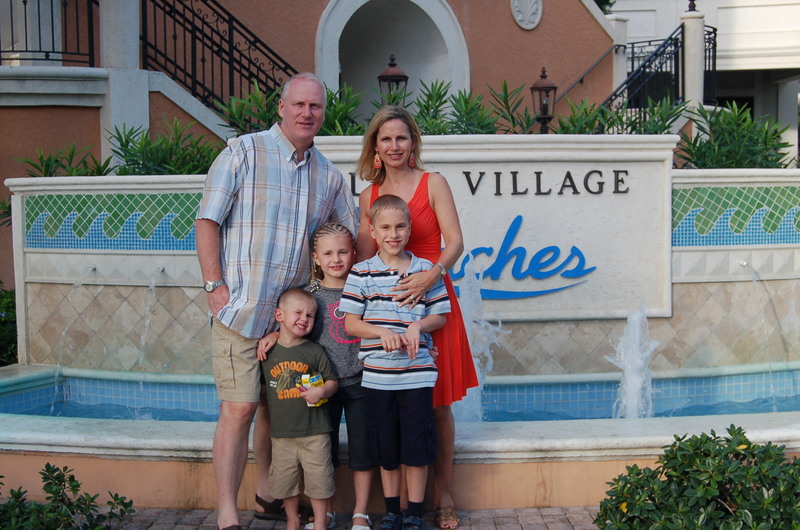 The Oswald Family on a recent family vacation. In the past, Tyler’s parents had to monitor him constantly because he wandered away from them with no recognition of danger. Now, with his newfound perception of his environment, he is less likely to wander away and more likely to agree to come back even when he sees something that catches his eye. Tyler working with his Davis Autism Approach Facilitator, Ray Davis. On the table is a model of “consequence” which is defined as “something that happens as a result of something else”. They have built a model of Tyler poking a balloon and it becoming a bunch of pieces. This process allows Tyler to develop an understanding how the world works and how he fits into it. Facilitator, Ray Davis, throws a Koosh ball while Tyler remains focused an attentive standing on one foot. 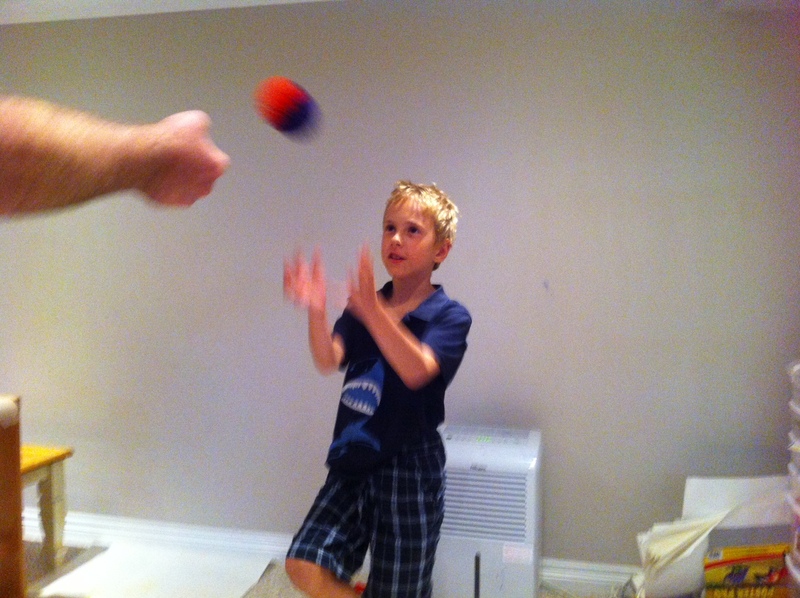 This exercise strengthens Tyler’s ability to focus his attention and improves hand/eye coordination and balance. Copyright © 2013 NOIT Research. All rights reserved. Copyright © 2013 by Ronald D. Davis – ALL RIGHTS RESERVED – Davis® and Davis Autism Approach® are trademarks and service marks of Ronald D. Davis. Professional services described as Davis® and Davis Autism Approach® may only be provided by Facilitators who are trained and licensed by Ronald D. Davis and Davis Autism International or Davis Dyslexia Association International. NOIT™ is a trademark of Ronald D. Davis.